Legislature Completes Session, Your Prop. 100 Questions Answered, Lemonade & More! The Legislature completed its session late in the evening of April 29. First the good news. Several attempts to undo voter-protected programs failed. The first, SCR 1033, would have allowed the Legislature to divert funds from voter-approved programs and deposit them into the general fund. The second, HCR 2041, would have required every ballot measure (except Indian Gaming) to repeal after eight years. If the bills had passed, they would have undone Prop. 301, which helps fund teacher pay and other education programs. But not all voter-approved mandates emerged unscathed this year. On November 2, voters will be asked to rescind First Things First, a program that provides infants and toddlers with a solid foundation to succeed in school. In 2006, voters passed First Things First, approving a tobacco tax to pay for early childhood programs such as quality childcare, preventative healthcare and parenting classes. In March, the Legislature mustered the votes to pass HCR 2001, which would transfer the program's $325 million into the general fund for other uses. The Legislature rejected offers by early childhood advocates to loan the state money from the fund. To see how your legislators voted on HCR 2001, visit AEN's seventh special session summary. In the last push to the finish line, the Legislature passed several bills related to education funding and reform. AEN is reviewing those bills for an update in a later post. As we head into the home stretch for the Prop. 100 vote (the May 18 vote is only two weeks away) we want to keep you up to date. Last week, we published a list of commonly heard concerns about Prop. 100, with research-based responses. Here is a new concern and a clarification. Is it true that the one-cent temporary sales tax will cost the average Arizona family $400 a year? An Arizona family of four would have to spend $40,000 dollars a year on sales-taxable items for that to be the case. According to the US Census American Community Survey of State Median Income by Family Size in the past twelve months (2008 inflation adjusted dollars) the median income of a four-person Arizona family was $69,452. Considering that many expenses such as mortgages and services are exempt from sales tax, it is highly unlikely that the average Arizona family would pay anywhere near $400 more in sales taxes. Based on input from a reader, we are clarifying the answer to the following objection to Prop. 100 published last week. Why are some people saying Prop. 100 is really an 18% increase? The 18% refers to the increase in the current tax rate of 5.6% to the proposed rate of 6.6% (if Prop. 100 passes). That is a simple mathematical difference of 17.85%. By calling Prop. 100 an 18% increase, opponents have created the misperception that the increase is really 18 cents on the dollar. Prop. 100 is a one-percent sales tax increase or one-cent on each dollar spent-ONE PENNY! If you purchase a DVD player for one hundred dollars you would pay an additional one dollar, not an additional eighteen dollars. A Tucson family came up with a fun and family-friendly way to turn "lemons into lemonade" to raise statewide awareness of the importance of K-12 education and promote Prop. 100. Join other Arizonans this Saturday, May 8, in setting up a Prop. 100 lemonade stand as part of "100 Stands for Education." Participants will hand out information about Prop. 100 and donate all proceeds to the public school of their choice. To register your lemonade stand and sign-up to receive Prop. 100 yard signs, stickers and materials to hand out go to http://www.100StandsForEducation.org/make-your-stand. Organizers are taking orders for T-shirts. Cost is $6 per shirt, with adult and child sizes available. The race for state Superintendent of Public Instruction is beginning to heat up. The person elected to replace the current superintendent, Tom Horne, will play a major role in critical decisions affecting public school funding and reform. A series of debates among the candidates will be held around the state. An upcoming debate, sponsored by the Arizona School Board Association, will take place Thursday, May 13, 2010 in Sedona at the West Sedona School, 570 Posse Grounds Road. A meet and greet reception begins at 6:30 p.m., followed by the debate at 7 p.m.
Dugan and Huppenthal, both Republicans, will run against each other in the August 24 primary. Kotterman and Williams will compete in the Democratic primary. I hear that the administrative costs for public school districts are exorbitantly high. Is this true? The 2009 Auditor General's Report on Classroom Spending released this March shows the average school district administrative cost is about 9 percent of each district's total budget. That's 1.8 percent BELOW the national average of 10.8 percent! For more information, check out Arizona Auditor General Report on Classroom Spending 2009: A Closer Look. Early voting for Prop. 100 is underway. If you received a ballot by mail, please remember to vote YES and send it back. You can also take your early ballot to any polling place on Election Day. You can request an early ballot be sent to your home until May 7. To find out how to request an early ballot, click here. Polls will be open from 6 a.m. to 7 p.m. on Election Day, Tuesday, May 18. Polling places will be limited since this is a special election. You may not be voting at your regular polling place. You also can vote early at several early voting locations. To find an early-voting location in your county or your polling place for the May 18 election, click here. It's National Teachers Appreciation Week! Check in with your school's parent organization for ideas and ways you and your child can get involved this week in showing support and appreciation for all our teachers do for our students. "Education is NOT Just a Walk in the Park"
A community event and walk Thursday, May 6, 4 - 6 p.m. Contact Krojahn1@cox.net for more information. A family-friendly community block party toasting Tucson's K-12 teachers. Friday, May 7, 5:30 - 7:30 p.m. The Tucson Symphony Orchestra will perform a free "Celebrate the Future" concert at the Concert Hall at 8 p.m.
For more information and a free parking pass for teachers, click here. Without the temporary sales tax, more than $420 million in K-12 funding will be cut. Prop. 100 will devote two-thirds of revenues generated to education funding and one-third to health and human services and public safety. The tax will automatically repeal on May 31, 2013. It would take a two-thirds vote of the Legislature or another voter proposition to keep the tax increase in place. 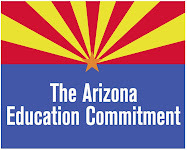 The Education Commission of the States estimates that this federal legislation to save our schools could bring $406 million to Arizona K-12 and higher education. For details click here. Vote YES on Prop. 100, the sales tax referendum, Tuesday, May 18. Vote for pro-education candidates in the primary election, Tuesday, August 24. Vote for pro-education candidates in the general election, Tuesday, November 2.